$135 billion was spent on digital marketing content in 2014 alone. 78% of CMO’s see custom content as the future of marketing. The list goes on but those are the most important and quickest benefits. But how do you go about creating content that doesn’t burn out you or your clients? Take the time to look at headlines and trending topics to take the pulse of the zeitgeist. Also, bear in mind the time of year – writing an article on how to put tire chains on is very useful, but not really in mid-summer. Keep things fresh by mixing different topics that don’t seem like they’d go together. For example “How to Invite a Fortune Teller to a Funeral” seems rife with ideas, invention, and originality – and is eye-catching enough that readers would click on it. 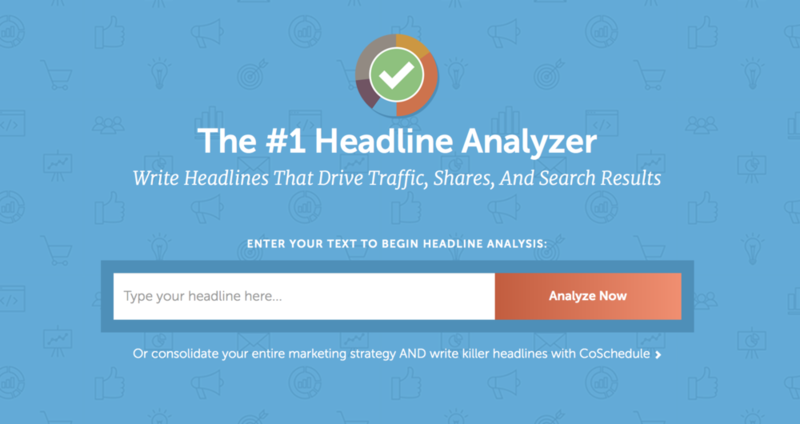 Or you CoSchedule’s headline creator tool! Don’t just stick to one way of looking at things; change up your perspective. For example, if last month you wrote a blog on color theory in fine dining and it was a huge hit with your audience, don’t fall back on writing about color theory in everything else. Maybe write next about black and white food combinations that will make you feel like you’re living in Casablanca! Every good writer knows what they’re writing about so the best way to do that is to live a little. For example, you might not love marijuana or have been diagnosed with depression but pretend. Read up on depression and its effects – and watch The Notebook. Try smoking a joint so you know how it feels. The best content creators are industry news junkies and scour the web every day for interesting stories that resonate with their customer base. Find out what are the best sites for you to find all the latest information on so you can become greater informed on what’s happening before then writing about it. Everyone is out there writing any old stuff but not everyone is you and has your distinct voice. So really use it to your advantage and set yourself apart from everyone else out there. Your audience doesn’t live to hear your every word. They might enjoy it tremendously but that shouldn’t stop you from serving up other voices, other articles, other content. Retweet, repost, etc those pieces you think resonate with your audience so you become a source of news and a thought-leader. You shouldn’t have to be the only one in your office constantly coming up with new topics and ideas. Put together a once-a-week meeting where people are invited to bring ideas with them and see where your brainstorm can take you. Make content creation a two-way street by asking your readers to contribute their own user-generated content. Perhaps you can ask them to describe the manners in which they’ve used your product, or maybe you can have them share meaningful experiences they’ve had with your company. Let them do the talking for you once you’ve invited them in. It’s not enough that your viewers/readers listen to you talking all the time; make some connections to other industry leaders and invite them to talk on your platform. This doesn’t have to just be a straight interview (although that’s the best way to start); you can give them a topic and have them write something for your audience. Take a look at the content you’ve already created and see how you can repurpose it from time to time. Rework what’s there, freshen it up, add to it, and repost it. Quora is a great Q&A website for people asking questions. See what queries are being asked about your industry and create content around that. If weekly meetings are too much for your already over-whelmed staff to participate in, open up a dedicated Slack channel so ideas can be shared and developed at the drop of a hat. It’s a place where people can post interesting articles that you can write about and link to, and if curated correctly can quickly become an endless source of inspiration. What are people talking about on one of the world’s largest social media platforms? Take a look by searching Twitter. A great way to do this is to write “Does anyone know [keyword]? Usually, reading the comments section on a YouTube page is like wandering through one of the layers of Hell. But from time to time you’ll come across interesting questions that aren’t being answered. Make those the topic of your content.